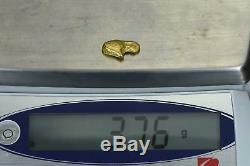 Authentic Alaskan BC Natural Gold Nugget weighs 3.76 grams. All Nuggets are Pictured or Partially Pictured with a U. Quarter which is 24.5MM in diameter to give you an idea of size proportion. They are guaranteed to be genuine and not man made as we test by sound, torch and scope for authenticity. Each nugget comes with a certificate of authenticity. In November of 2013 I opened up my Gold Nugget store. With thousands of satisfied customers I will continue to strive to provide the highest quality, largest selection and best priced gold nuggets on. What is a Natural Gold Nugget? It is a piece of gold that broke out of quartz deposits within the earth when erosion took place. It also goes by the name Placer Gold and each piece is a one of a kind with no two being exactly alike. Where can they be found? Wherever the effects of erosion took place. That would include rivers, streams, ancient dried Exported By ExportYourStore. 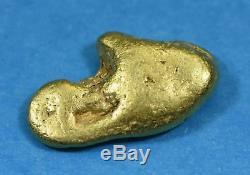 The item "#346 Alaskan-Yukon BC Natural Gold Nugget 3.76 Grams Genuine" is in sale since Saturday, November 17, 2018. This item is in the category "Coins & Paper Money\Bullion\Gold\Nuggets". The seller is "nuggetsbygrant" and is located in us. This item can be shipped to United States, Canada, United Kingdom, Denmark, Romania, Slovakia, Bulgaria, Czech republic, Finland, Hungary, Latvia, Lithuania, Malta, Estonia, Australia, Greece, Portugal, Cyprus, Slovenia, Japan, Sweden, Indonesia, Thailand, Belgium, France, Hong Kong, Ireland, Netherlands, Poland, Spain, Italy, Germany, Austria, Bahamas, New Zealand, Singapore, Switzerland, Norway, United arab emirates, Qatar, Kuwait, Croatia, Malaysia, Chile, Colombia, Viet nam.